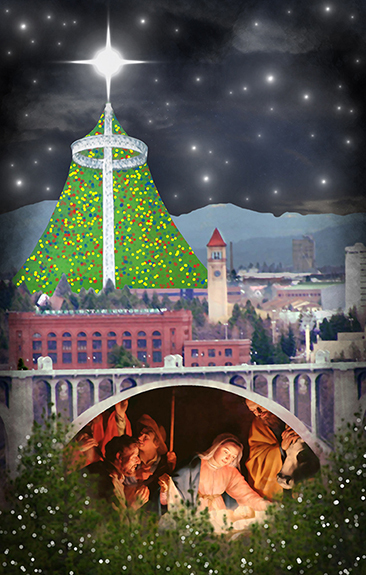 I do an annual Christmas cover for the Inland Register, the diocesan newspaper of the Roman Catholic Diocese of Spokane, Washington. This year’s cover was a bit too involved for a full-blown Photoshop tutorial, but I thought it might be instructive to outline the basic construction sequence. 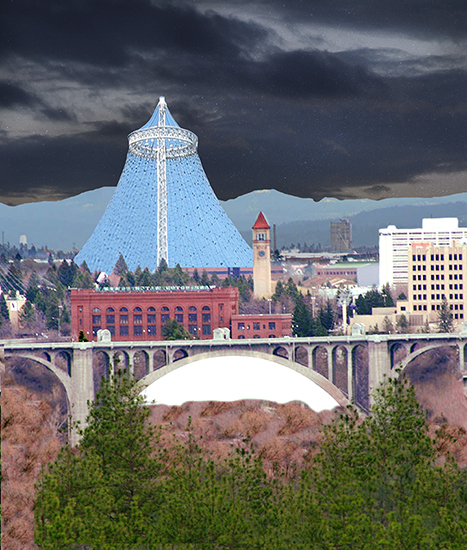 I got the idea from looking at this cityscape photo of Spokane. 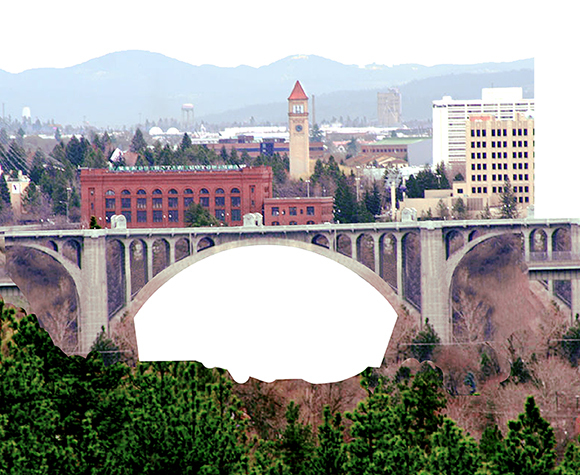 I remember thinking: it’s too bad that second bridge is in the foreground– but perhaps it could be removed in Photoshop. Here’s my original rough sketch. 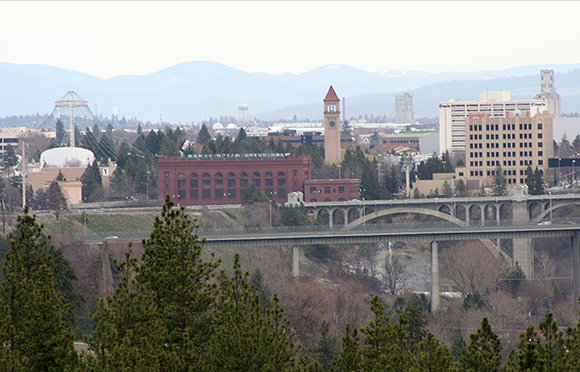 You can see the “Lampshade” on the far left of the cityscape photo. 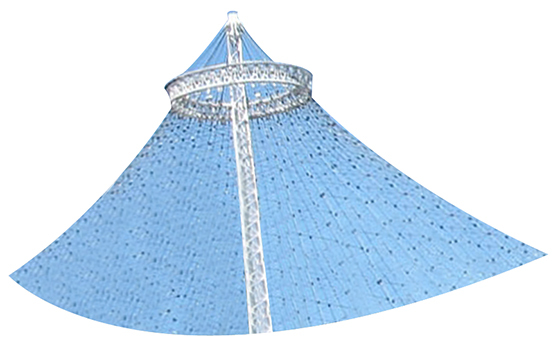 It was constructed for the 1974 World’s Fair, and was actually the support structure for the tent which housed the U.S. pavilion. 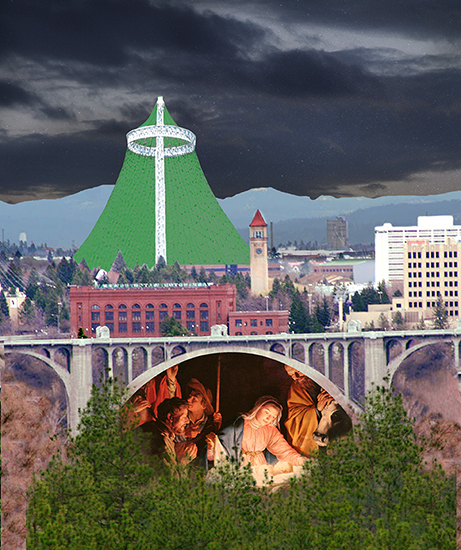 The people of Spokane decided to keep it as a monument to the Expo, and it still stands today in what is now Riverfront Park. 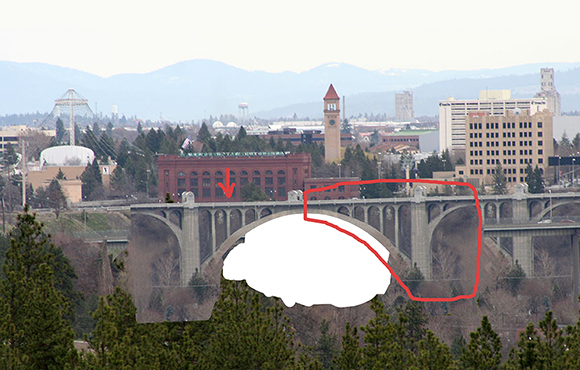 My first step was to extract the main bridge section, and carefully clone out the near bridge in the area circled below. I pasted in the rebuilt bridge section, then duplicated it and flipped it horizontally to create a symmetrical left-hand side (red arrow below). You can still see segments of the original bridges (now on a lower Photoshop layer) on the outer edges of the image below. I used the Pen tool to cut out and delete the area below the arch. I extracted the foreground pine trees from the original photo, duplicated them to create a symmetrical grouping, and pasted them into the foreground of the image on a new layer (red arrow). 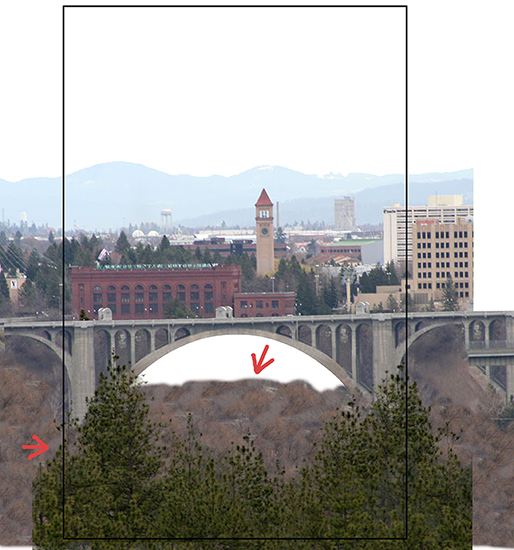 I used the Clone tool to create a uniform “scrub brush” area around the base of the bridge (red arrow #2). I used the Rectangle tool to block out my cover area– always good to step back and see what you’re doing!! 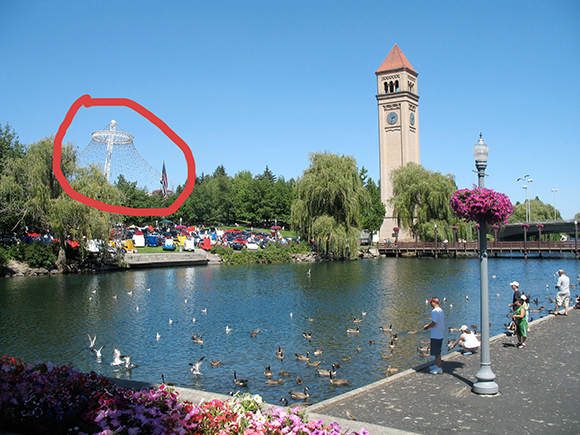 The Lampshade in the original photo was too murky and difficult to extract, but I found the top section framed against clear blue sky in this photo of Spokane’s Riverfront Park. I extracted the Lampshade section (surrounding trees and all), and used the Clone tool to extend it. Then I used the Pen tool to give it a rough Christmas tree shape. I pasted it into my main image, scaled it up, and used the Liquify filter to give it a nice uniform shape. I used a layer mask to create the illusion that the Lampshade is physically behind the buildings and trees. Time to insert some night sky. I pasted in two separate photos– starry Milky Way, and moody clouds– and used blending mode = Multiply to combine them. 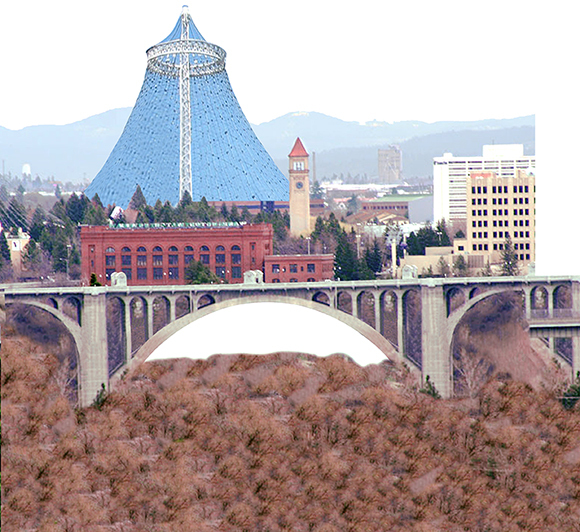 The foreground pine trees and the scrub brush layers have been turned on, and are again visible in the image below. The painting image was too dark, so I applied some color adjustments to brighten it up and give it some warmth. 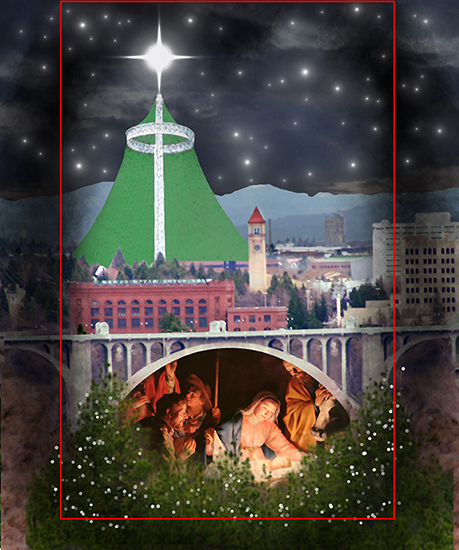 I pasted the Nativity scene under the bridge, and used layer masks to blend the images together (Nativity, bridge, scrub brush, foreground pine trees). I applied a Hue/Saturation adjustment to convert the Lampshade Christmas tree from blue to green. I used two different Photoshop “Star” brushes to add The Star on the Lampshade and the scattered smaller stars. I used a “Bokeh” brush to add white lights to the foreground trees. 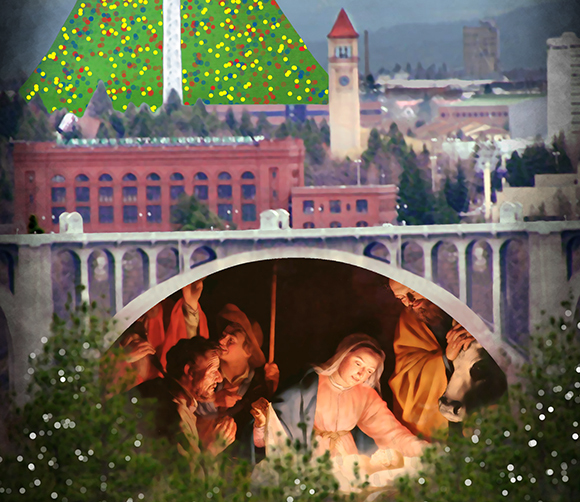 I applied a Noise>Median filter which allowed me to blur both the cityscape and Nativity images while “retaining edges.” I used a layer mask to reduce the blurring of the Nativity faces so the expressions could be seen more clearly. Final step: I used a small hard brush with a wide scatter setting to apply red, blue, and yellow lights to the Lampshade tree. Here’s the final again. Scroll down for a larger detail image. What do you think? 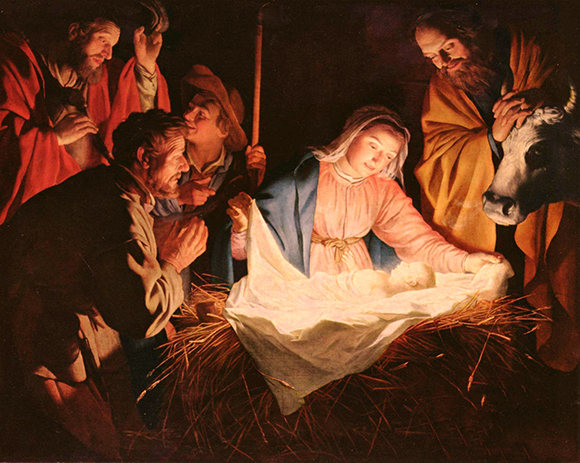 Does it convey an effective Christmas message? Anything you’d have done differently? Hope you’ll leave a comment. Hey, Steroid User– You Look SWELL! ← Pass The Popcorn And Embrace Your Inner Child! This is truly beautiful. It conveys the message well and you made the painting look so much better by altering the colour. It now looks like a proper painting that portrays warmth and light. I’m typing this… with one finger… reaching up to keyboard… as I lie on floor… your comment… packed such a wallop… of kindness and support… it knocked me… off my chair…! You’re very welcome — it is what I truthfully felt, so I had to say it. That’s always the problem with laying on the rug. What a nice combination of elements! I can barely guess how many layers you ended up with when you were almost done! Wow!! What a GREAT concept and image! I love how you brought this together, how the old and the new, the real and the not-real dance so beautifully in one image. Gorgeous and intriguing! Thank you for sharing the Photoshop steps, too!!! You’re a true master! Gosh awmighty shuckins! I’m blushing so furiously, that if I were standing next to Rudolph Reindeer, his nose would look completely desaturated!! Desaturated his nose must be before red it can again become. The blush be with you. You know, you walked through all the steps and yet I would still never be able to create such a piece. Takes talent and a whole lot of patience to do art, and in my opinion especially on computers (never my forte). Thanks for viewing my blog. It’s always good to hear what people think of my work. Your Photoshop tutorial and finished illos is very inventive. It takes a lot of skill and imagination to pull so many different images together into one cohesive illustration. Hats off! Thanks, Chris. Coming from an illustrator as accomplished as yourself, that compliment means a lot. Your work, as showcased on your blog, is enormously impressive and very inspiring. Thanks for stopping by, Merry Christmas, and much continued success to you in 2012! Man! ups…Mark! You did a brilliant job! I do love it! 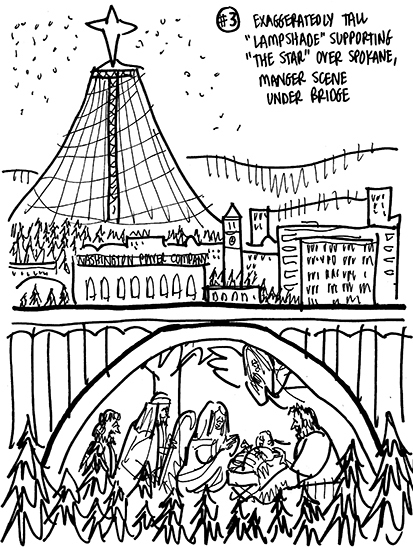 I love your idea of putting The Holy Family under the bridge so it does convey a Christmas message. Really love that idea! Thank you, dear Inge, for your kind and enthusiastic support!